For a city-based artist like me, getting into the car and taking off for a few days to get into nature is just about the best thing I can do to reboot my brain. When I'm lucky, I get away at least twice a year for several days to different locations in Massachusetts, my home state. Click on the one-minute video below to enjoy a sketching session on Race Point Beach of Provincetown, the furthest tip of Cape Cod. My patrons sent me here a few months ago. You'll notice the mellowed earth tones of the beach in autumn... golden ochres, plums, siennas... just gorgeous. The retreats are building on themselves one year at a time. 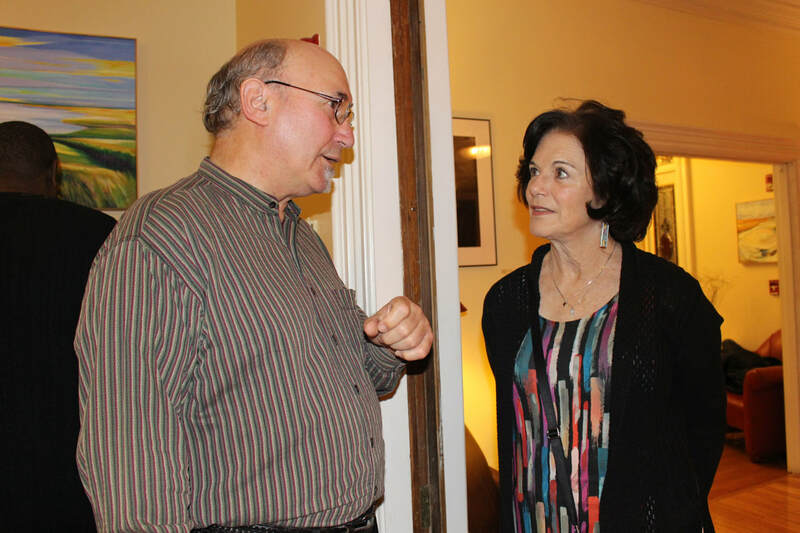 -In 2014 I stayed at the home of relatives and explored the South Coast of Massachusetts. 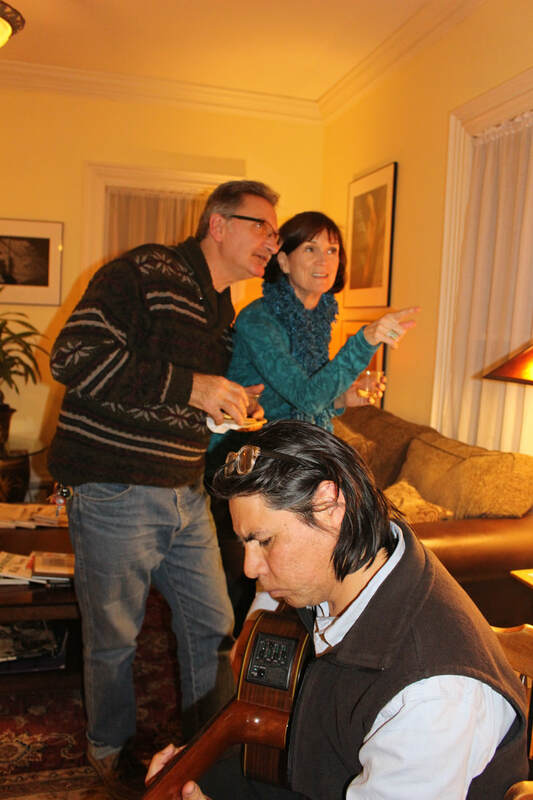 -In 2015 I got an informal artist's residency on the island of Nantucket, a real treat (blog about that in June 2015, if you care to look in the Archives sidebar). -In 2016 I took a trip to the North Shore to Halibut Point State Park in Rockport, on Cape Ann. -In early 2017, I set up a Patreon page, and quickly, patrons began to subscribe. 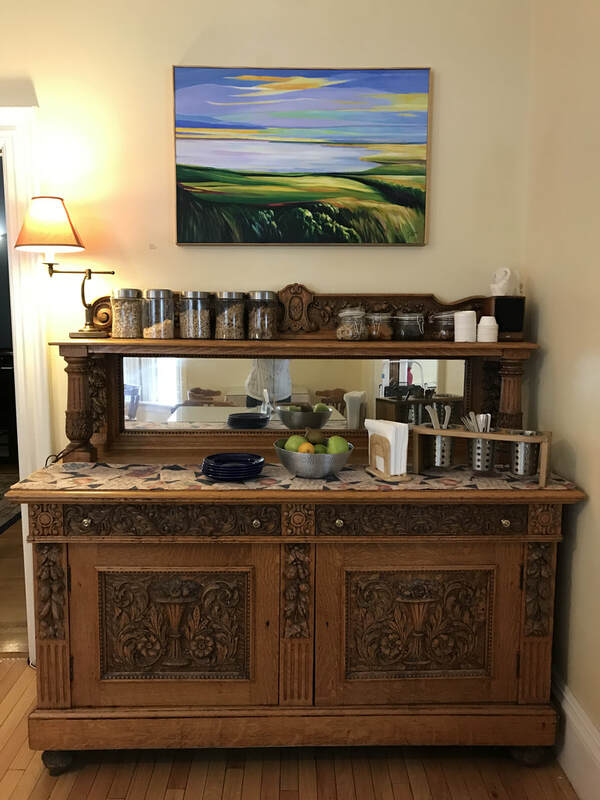 Then I was able to revisit Cape Ann to stay at the Emery House, a beautiful country monastic house, and I explored nearby Plum Island in detail. I shared the experience with my patrons and kept them up to date on the works in progress in the studio. -Later in 2017 I went to Provincetown to explore the Cape Cod National Seashore over four days (where I shot the video above). Now that I had a patron community building up, I shared what I learned and saw with them via video posts. 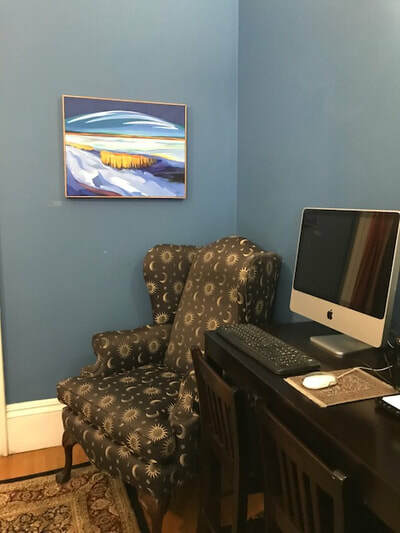 If you are curious about my patron subscribers and how they microfund these painting retreats, click here to see my Patreon page. You're welcome to see some of the public posts and videos there. Some are for patrons only. I hope I've inspired YOU to travel, sketch, and dream... it is a joy! 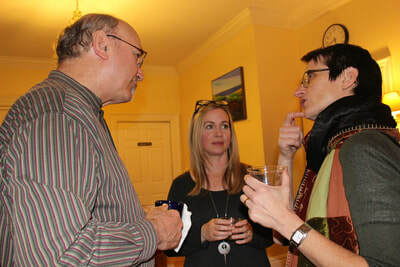 On Thursday December 7th, from 5 to 7 pm, the Harding House Bed and Breakfast hosted a lovely wine and cheese reception for photographer John Heyman, and myself. Back in the spring, the owners of the Harding House selected artwork through the Cambridge Arts Council in order to install a year-long show in their reception area, living room, and dining room. 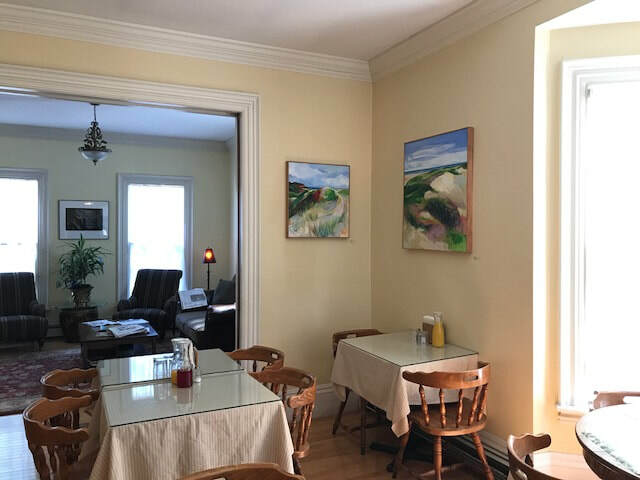 Our artwork will remain up until June 2018 and is being shown on a rental arrangement at the Harding House. Here are some pictures of our event! 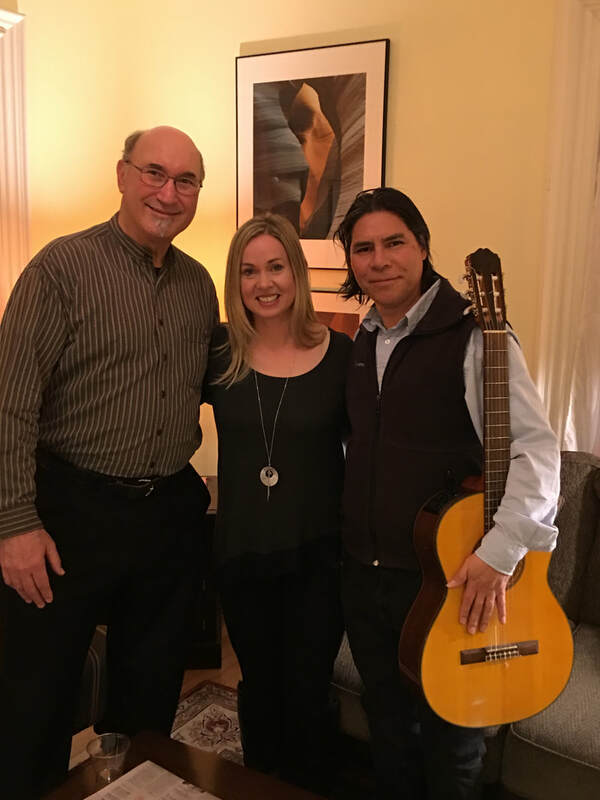 We were honored to have Mario Santiago with us, who played acoustic and classical style guitar for our event, enjoyed by some of our 40+ guests who dropped by. The Harding House is located at 288 Harvard St., Cambridge. If you are local and you're interested in seeing the show, you can drop by during the day anytime, there is always someone at the reception desk. 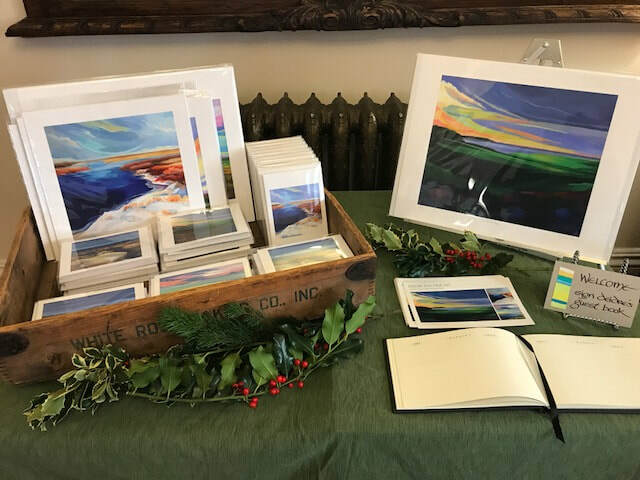 If you are interested in any of the pieces, you'll find a booklet on the coffee table in the living room that lists John's and my work and the price list. If you are not local and are interested in any of these pieces, please contact me and I can help you. Thank you! 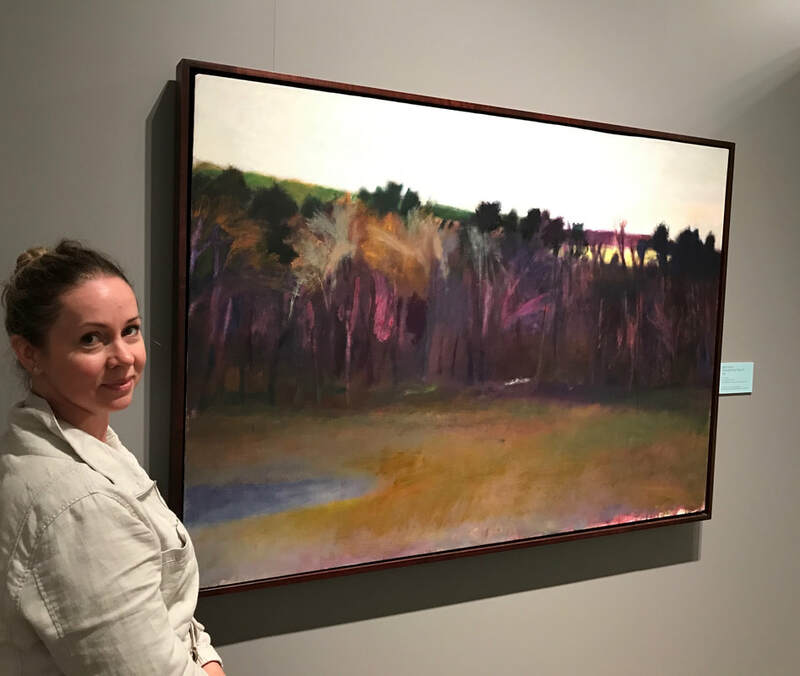 My family and I went to see this great show on Cape Cod at the Heritage Museum and Gardens, Painted Landscapes: Contemporary Views. This show brought me the pleasure of seeing the work of two artists whom I've admired but whose work I had not yet seen in person: Wolf Kahn and April Gornick, both living contemporary artists who love landscape painting, as I do, and who have contributed many many works to the canon of American landscape painting of the 20th and now 21st century. 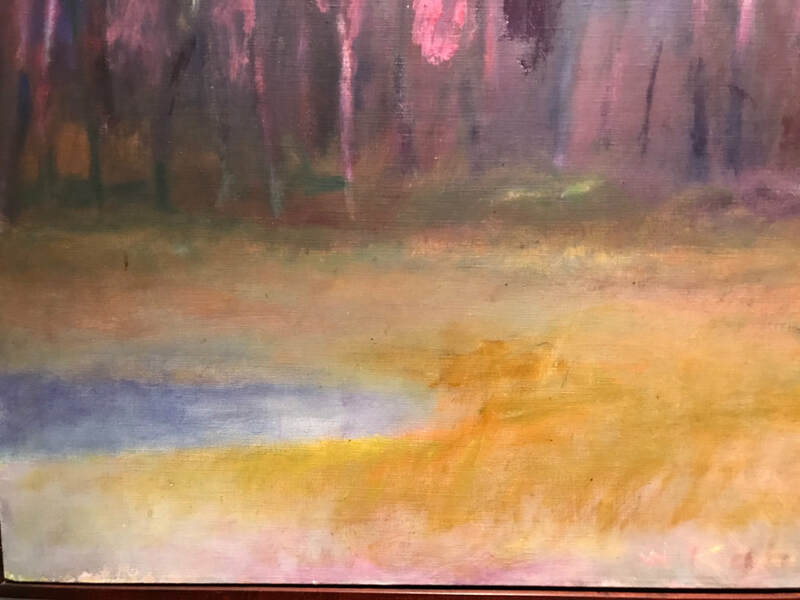 This piece by Wolf Kahn, Pond and Pine Trees, #2 is just sumptuous! I love the way Kahn uses color and application. Sometimes his paint looks transparent and brushy, and other times it is applied thickly and seemingly spontaneously. The colors are really successful in creating a feeling of mystery and light. It was a delight to see his work in person and to spend lots of time taking it in. He's based in Vermont and themes of forests and fields are a favorite in a lot in his paintings. These are two details of Wolf Kahn's painting. 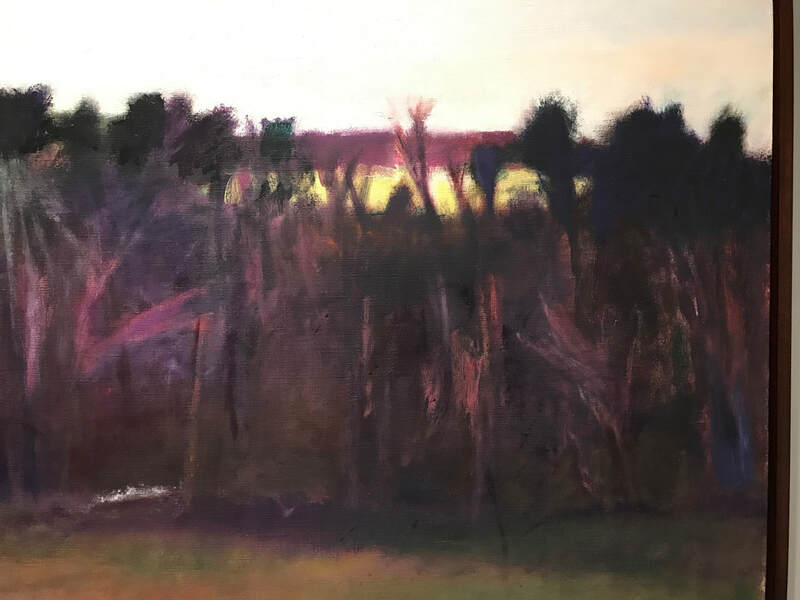 This painting by April Gornick, entitled Approaching Night, is just breathtaking. This piece is one of, if not the largest, pieces in the show. It feels very epic and monumental, almost like you climbed this mountain partially and then stood in awe of the glorious sky. The cloud formation is weird, angular and unusual, and made me wonder if it really appeared that way when Gornick saw it. I love the bright pink-coral color between the crests of the hill, and the stark contrast of the dark shape in the foreground juxtaposed against the soft sky. I highly recommend this show as a whole, and it is in such a gorgeous setting of meandering gardens at this special place. Go check it out if you can! 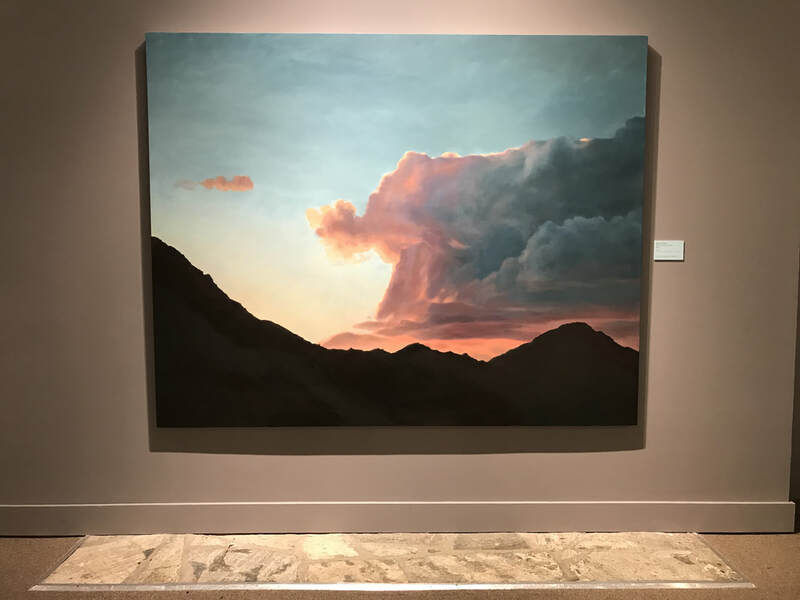 The show closes October 9th, so there is still time to see it if you haven't already! Shows to see if you're vacationing in or living in Massachusetts! 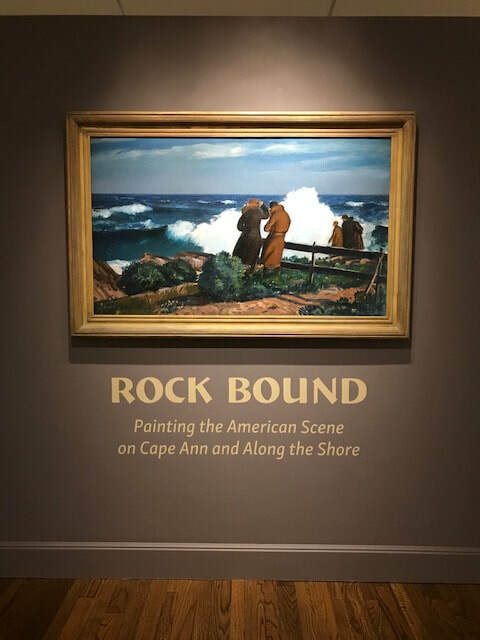 I am so lucky to have had the opportunity to check out two fantastic shows in the last 3 weeks: Rock Bound at the Cape Ann Museum, Gloucester, MA, and The Painted Landscape: Contemporary Views at the Heritage Museums & Gardens of Sandwich, MA. Rock Bound is a grouping of paintings from the first 30 years of the 20th century in the Cape Ann area, which includes Gloucester and Rockport (I had blogged very recently about Rockport and Halibut Point; scroll down to read and see paintings and works-in-progress I did based on that 2016 excursion!). I recommend getting to this show if you have the chance - it runs through October 29th. 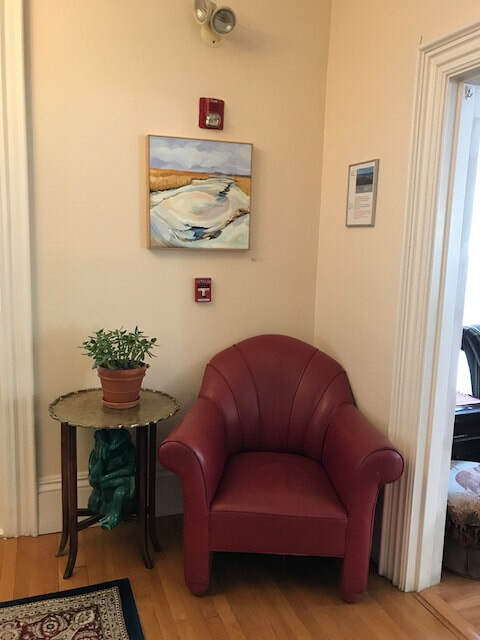 The Cape Ann Museum is a great find in itself, and was recently renovated and has some amazing pieces in the permanent collection! Click here to read more from the museum. Image #1: Gifford Beal, Northeaster #2, Bass Rocks, 1930, Oil on board. Image #2: Marsden Hartley, Rock Doxology, Dogtown, 1931, Oil on board. Image #3: Stuart Davis, Gloucester, 1919, Oil on canvas. Image #4: Hugh Breckenridge, The Cape Ann Shore, 1924, Oil on canvas. There were many more pieces in the show that showed people at work fishing, or people at leisure swimming at the beaches, which conveyed the energy of the community and was part of the point of this show. But what I loved about these particular pieces were the energy of the water, vegetation, and the rocks themselves as natural elements. I absolutely love the interplay of the shapes, lines, and colors in these three paintings by Beal, Hartley, Davis, and Breckenridge. These landsape paintings are so powerful and lively to me. Look at the skillful shape of the huge white waterspray splashing up against the rocks in the painting below (Northeaster #2). See how it creates a big white area like a cloud that makes the figures in the foreground seem almost cowering in reaction to the force of the splash! The way that Beal painted their response to the spray is great. They're holding their coats closed with their left hands, bending and shielding themselves somewhat from the wind and the power of the ocean. It makes you feel like you yourself relate to the people in the painting. I think this must be why this was the painting chosen to act as the centerpiece of the show. Check out the whitecaps rolling in towards you!! What action, I love it!! Check it out!! Marsden Hartley is a master (above). Come on, look at this "wall." It is flat and stacked up with harsh, angled black outlines and rather monochromatic in gray, burnt siennas, and burnt umbers and hardlined shadows. It's a little hard to "enter" this painting with its confrontational wall, but I'm still drawn in, aren't you?! These boulders are sun-baked and expressive with a light source. Notice the clouds almost mimic the rocks above as white discs stacked up in the sky. Don't you feel like you're climbing? I get a real sense of place from this painting. This is a true Northern New England rocky scene. It's craggy. It's a little harsh. I like that. The label next to this piece said Hartley wrote, "I go alone, empty-handed & sit in Dogtown Common - a weird stretch of land - all boulders and scrub." Yes, he translated that into paint very well. He also observed that the place looked like "a cross between Easter Island and Stonehenge-- essentially druidic in its appearance." I too feel an ancient and spiritual connection to these giant boulders when I sit in their presence. You just feel so small and short-lived next to these old giants. I think I can relate to what Hartely felt. Now, in contrast to the Hartley painting, this piece (above) by Stuart Davis shows sinewy and bumpy lines, making your eyes travel and bounce through the entire painting. I don't even get around to seeing the horizon line in the back for several minutes, do you? I'm so caught up in the trio of buttery-yellow-leaved trees right in the front, supported by the dark red and brown earth tones, like a great bass line, all along the curves of the land and rocks. Is it autumn? Who cares! It just works on its own without so many rules. It's downright playful. Look at how small the sailboats are way in the back. Then finally there is just a thin blue line - I do that too in my work - to suggest maybe a land mass beyond the water, or maybe a change in current in the ocean which changes the color. Who lives here, works here? Who walks here? In fact, I think I see someone walking in the foreground but maybe it's my imagination. Do you see what I see, or something else? Look how many colors Breckenridge discovered in the rocks... even cobalt blue!!! I mean, come on, that's the same blue you see in the ocean... then there's indigo and a delicious purple. Look how those cold colors sing next to the rosy oranges. The ochres and even an intentional focal point of gold in the center of the painting just completes the visual feast (nice frame choice helps that gold, my compliments to the framer's eye). 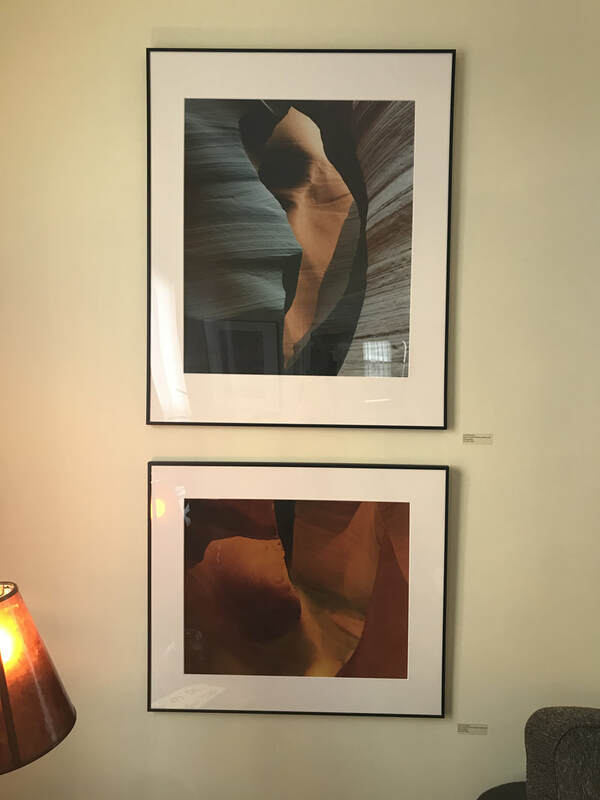 I can relate to this artist and his fascination with the discovery of color within the neutrals of rocks and all its nuances. These rocks in this piece remind me of gemstones, angular and cut, broken and fallen on the ground. It is a really beautiful painting. And I love that the sky is gray. He gave us a rainbow in the rocks, but he didn't overkill it by going there in the sky; he kept his cool and that makes his foreground glow all the more. 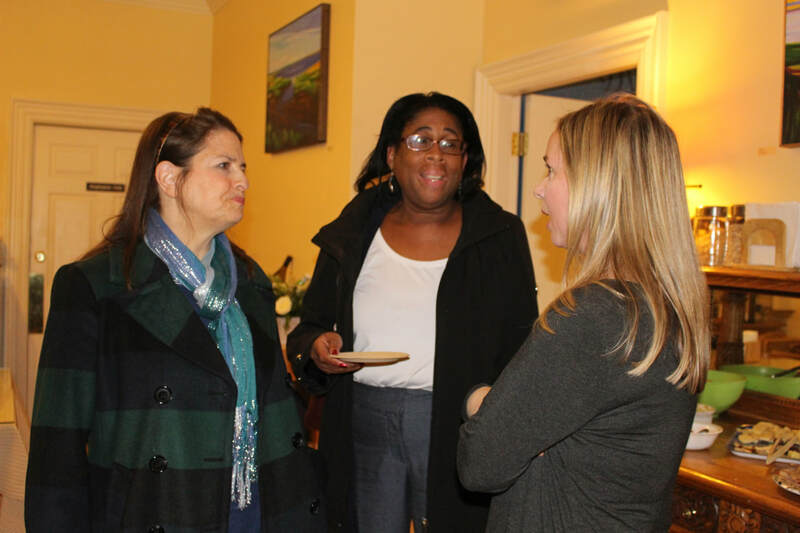 I love to learn from these mentors! These paintings teach me so much. 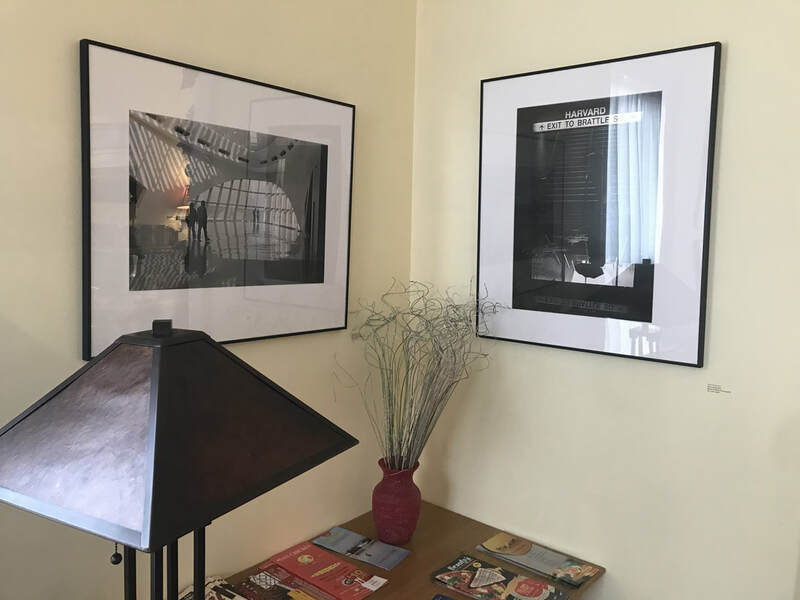 I hope you enjoyed them too, and maybe you can get to the Cape Ann Museum too before October 29th and see these, and more, in person.